Remember Getting Vouchers For Your Birthday? 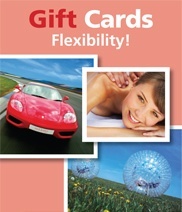 Everybody remembers getting vouchers for their birthday or at Christmas. Whether it was Marks and Spencer, Next or perhaps your buyer was a little more generous and gave you HMV or Game vouchers! Store vouchers always seemed to be the present people bought who really didn’t know what to get but had a vague idea of the recipients interests. It was a little better than writing out a cheque or giving cash as the buyer had to walk into a store and purchase the vouchers, however they did/do restrict the recipient to that store and their products. The good news is there is a great way to give vouchers that are both meaningful, special and put a huge smile on the recipients face. I am talking about vouchers for experience days from companies such as Red Letter Days or Virgin Experience Days. With an ever growing list of things to do for males and females of any age and of any interests this makes the perfect present. The best part of all is that if they cannot find any suitable experiences (you would be hard pushed!) then vouchers can be exchanged for gifts such as Blu Ray players, watches etc (whatever the voucher is worth). You can not go wrong with giving experience day vouchers for a 21st birthday!